Scott raced at Breckenridge immediately after Alpine Champs. 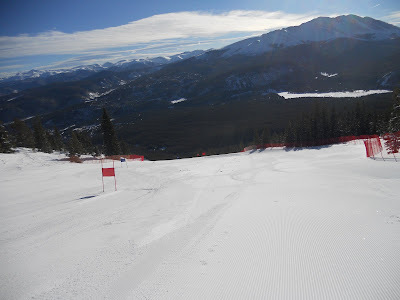 The course started at 11.500 feet of elevation and someone said it was the highest Giant Slalom start in the world. Regardless, it was high enough. Standing at the scoreboard one could hear the heaving chests of the athletes as they finished and came to see their result. Those of you who have been following this blog know that it's been a hard year. Nearly every opportunity for bad luck has manifested, sometimes on its own and sometimes with a little help from Scott. There have been some great runs, followed by a mishap, and there have been days with nothing but mishaps. After a while it becomes difficult to keep going, to bring expectations back where they belong for success. Scott came to Breckenridge hoping to "kick start" the final part of the season. Things had been improving, in that he'd finished most of the recent tech races and felt better on his skis. It was time to get going. He skied well in the two Giant Slaloms. Each race had one run with an error. Both errors happened just above the flat section, thus having the greatest impact. Notwithstanding, he did finish well and score some FIS points. He feels good about his skiing and is looking forward to the Western Region Spring Series, beginning this week in Washington. The points will be good there and he should finally get reasonable start numbers. All we need is a good race surface. Hopefully he can end the season on a strong note and set himself up for good start positions next year. We're at home tonight, making a cameo appearance to do laundry and cross-load gear for the final two weeks. It was a tough commute. Last night we drove until midnight to make Salt Lake City. Today we logged another 11 hours and we hit the road at 9AM tomorrow. Sure do love this stuff!